In 1991 the late Peter Roebuck retired from first-class cricket, but it turns out his playing career was not quite over – for which Devon cricket will be forever grateful. 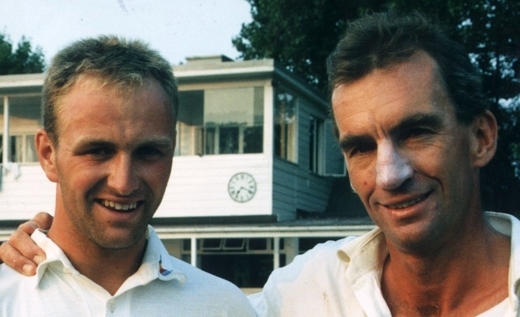 Geoff Evans, chairman of Devon CCC, remembers a golden era. Some 20 years ago, following our pre-season friendly against Somerset Seconds at Taunton in which the recently retired Peter Roebuck had looked supremely fit, I joked that perhaps Peter might be interested in taking a little summer exercise with Devon County Cricket Club. We were faced with producing a team for the upcoming knockout fixture and, as ever, beset by player unavailability and a shortage of bowling options. It was agreed I would contact Peter. His immediate reaction to our invitation to play for Devon (without payment) was a firm declaration that he would not wish to impede the progress of any promising young batsman. We have plenty of competent batsmen, we told him, what we need is a bowler. “Oh, I won’t take offence at that,” Peter said. He turned out initially for Sidmouth and later for Budleigh Salterton in the Sunday league fixtures, and subsequently became a summer resident of Exmouth. He enrolled his parents as vice-presidents at £50 a head, and became Devon captain. Thus began a golden age for Devon cricket, not only in terms of trophies and championships and records, but, more importantly, the manner in which the cricket was played. As captain, he ensured talented young local cricketers were not denied a chance at a higher level. The most notable beneficiary was Chris Read, who was able to keep wicket to Stuart MacGill (then eligible for NatWest matches). Read made a memorable hundred for Devon against Holland at Wormsley and was presented with a county cap before his inevitable disappearance to a higher sphere. His selection for an England A Tour – before he had played a first-class match – delighted our captain. After masterminding the most successful period in the club’s history, Peter decided to retire from all cricket at the end of the 2002 season, leaving behind a dressing room devoid of discord. “I have encountered a common humanity absent from the professional game” he reflected. His positive example as to how the game should be played made a huge impact but not in Devon alone; it also encouraged a number of other Minor County captains, which has benefitted our level of cricket. The others, however, were probably not treated to the occasional unconventional manoeuvres witnessed by his adopted county. Once, following a frustrating spell of shoddy fielding by his troops during an important local derby fixture against Cornwall at Truro, Peter instructed all his men on the offside to exchange places with those on the legside. Notwithstanding the captain’s intimidating double teapot pose and aggressive demeanour, initial bewilderment soon gave way to amusement. The required level of concentration was restored, the game was won. Here in East Devon, it is hard to imagine that never again will that fit, upright figure bedecked with the straw hat ­– more often the pointed Ho Chi Minh model but also, on more blustery days, the flatter Confucius version – appear unannounced on the doorstep, en route to Budleigh Salterton CC. May peace now be granted to an extraordinarily gifted, troubled soul.